While there are thousands of barbecue style recipes for baby back ribs, this preparation demonstrates the power of simplicity. Baby back pork ribs, one side, typically about 3 lbs/ 1.5 K.
Ground Black Pepper, 1 Tablespoon. Parsley, dried, 0.5 cup/140 ml. Frank’s/Durkee’s Red Hot sauce or equivalent, 3 oz/75 ml. Butter, unsalted, 2 oz/ 60 g.
Worcestershire sauce, 1 oz/ 30 ml. Kecap manis or balsamic syrup, a few drops (optional). Sheet pan/cookie sheet, lined with parchment. 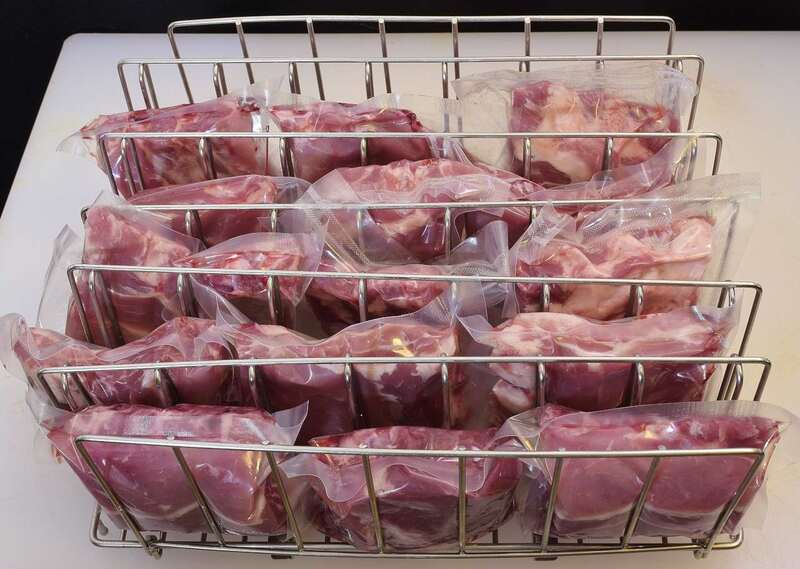 Because of the unique characteristics of sous vide, the whole rack can be divided into smaller pieces to be packaged and processed separately using the same time/temp parameters, as shown below. If you want to use self sealing bags (Ziploc freezer bags) for this, it is easy to remove the air from the bag using the water displacement method. 135 F/57 C for 18 hours. Let sous vide timing work for you! Sous vide has a number of unique characteristics. The rate of collagen conversion in the sous vide range of temperatures is very gradual. The difference in texture and appearance between baby back ribs processed for 12 hours and baby back ribs processed for 18 hours (at this temperature) is negligible, if detectable at all. Some people want to start their ribs in the early morning to serve for tomorrow’s barbecue, so the 12+ hour interval is convenient for them. Others would rather start the process the evening before and sleep in–they will still have time to serve their ribs for dinner. Both approaches are favorable! When the time has elapsed, remove the pouch(es) from the bath, and submerge in iced tap water until the package achieves 70 F/21 C. This usually takes about a half an hour, and is important for food safety compliance. Do not attempt to accomplish this in the refrigerator or freezer, because it will put other foods at risk by raising the ambient temperature. After cooling, refrigerate the package(s) over night or until they achieve 40 F/4 C.
Dip the entire bag in hot tap water to melt the surrounding gel. Remove the processed rack from the bag, save the juices in a microwaveable container, and lay the rack on parchment or butcher paper. Pat dry with a clean towel or paper towel. Beat the egg whites with a fork and use the pastry brust to paint the top surface of the ribs. Sprinkle with the salt, pepper and parsley. Preheat your oven to 500 F/260 C. Put the ribs in the oven and reduce heat to 400 F/204 C. This assures an aggressive sear on the surface of the ribs. Roast for a minimum of one hour or until they achieve the desired appearance. Allow to cool on a sanitary cutting board for 5-10 minutes. Process the reserved juices in a microwave oven until they begin to boil–they will turn from pink to gray in color, with clear liquid visible at the bottom. Pour this through a moistened coffee filter or paper towel sitting in a strainer and combine with the Honey, Frank’s/Durkee’s RedHot sauce, butter and Worcestershire sauce.in another microwaveable container. Heat for one minute in the microwave or until the butter is melted, stir well. Pour into three serving cups and drizzle with the syrup (optional). Arrange the ribs on the plates as shown below (or however you like!). Excluding the ever present garlic, paprika and other colorful and powerful herbs and spices typically associated with this dish gives the meat the opportunity to display its fresh and vibrant natural flavor. A dipping sauce that provides sweet/sour notes with an umami kick allows the diner to control his experience bite by bite.